Self-tapping pozidriv screw manufactured from 316 marine grade stainless steel (A4-AISI). 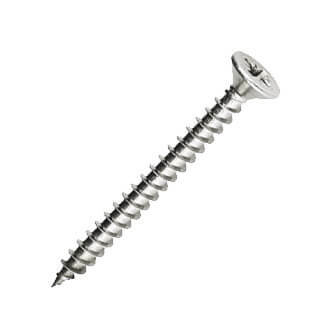 A self-tapping screw is designed to tap its own hole as it is driven into timber. Countersunk head for a flush finish. The screws were fit for purpose. Size I needed supplied after a phone call. Screws countersunk were used to alleviate any sharp edges for little fingers.